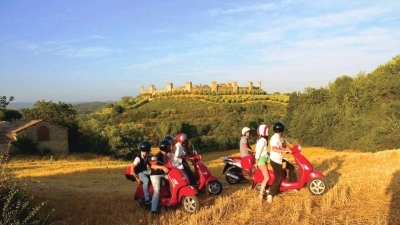 Explore the Chianti region on board a symbol of Italian culture: the legendary Vespa. Have fun riding a Vespa along the scenic and peaceful roads of the Tuscan hills. An alternative way to admire the views of Chianti, surrounded by the scents of the Tuscan countryside and the sound of working farms. Eurocasa Holiday is happy to arrange for you this unique day, so that you will be able to live an authentic experience in true Italian style. You will always be accompanied by a guide who will show you the small medieval villages located in the heart of Tuscany. If you do not feel confident enough to drive the Vespa, you can rely on one of our expert drivers. During the journey then, you will have the opportunity to stop at a farm to taste excellent wine and have a light lunch. • Pick up and Drop off service only in Siena. •Drivers must be at least 18 years old and passengers at least 13 years old. • If you sign up as a driver you must be able to drive the scooters. •Please note that pickup and drop off are included in the price for accommodations located within 20 km from center of Siena.